the snow leopard and nala. Here is a snow leopard and nala came to her country. Wallpaper and background images in the o rei leão club tagged: nala snowl eopard country. doesn't look like nala but simba! 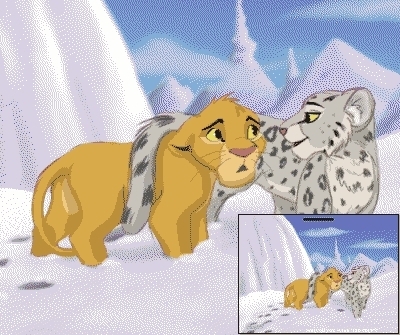 that dose look more like simba than nala that explan a somewhat how they met to becuse if it was nala how dose she know the snow leopard she was with the lionness untill she grow up but if it was simba he could have met the snow leopard when he was growing up with timon and pumbaa. right?